When most simple items get old and don’t fulfil their functions anymore, they are not hard to dispose of. The larger and more complicated they get, the more of a hassle it becomes. So it comes as no surprise that most people assume that disposing of a vehicle is going to be super hard. However, if you live in Beckenham 6107, Perth it actually turns out that cars can be disposed with great ease! And best of all, you will not only not be required to pay money, but you will get paid as well! Here at Perth Auto Wreckers, we buy old, used and permanently broken down cars on a regular basis. And then we dispose of them! Whether it is a car, truck, van, SUV, Ute or 4×4, call us at 08 9452 8859 or fill out the form on our website. We can provide you with a free quote if you want to know how much we will pay for your car. Knowing what parts to keep and what parts to scrap on any given permanently broken down vehicle can be a hard task. It requires a certain amount of knowledge that can only come with experience. And it is the most important part of determining how much a vehicle is worth. Here at Perth Auto Wreckers we boast a team of professionals with over twenty years of experience between them. This ensures that you will get the best possible deal on your automobile no matter what. 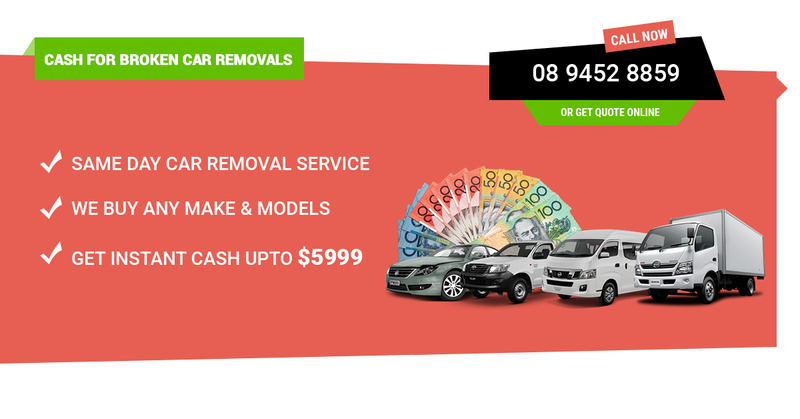 Free car removal service works as first come first serve basis. There is a lot of cash for cars, auto wrecking companies operating all over Australia. If there is one thing they all have in common it is the fact that they somehow find ways to not have to pay for the cost of removal. They will either require the customer to pay a towing service to move the automobile to their salvage yard before they buy it, or they will simply pay less than the vehicle is worth. Here at Car Wreckers Perth, we don’t do either. We perform the removal service that we offer completely free of charge. So you don’t have to worry about extra fees. We buy every make and model. This includes Mazda, Peugeot, Nissan, Isuzu, BMW, Toyota, Honda, Ford, Suzuki, Audi, Volkswagen, Chrysler, Daihatsu, Mitsubishi, Renault, Fiat, Chevrolet, Daewoo, General Motors, Hyundai, Jeep, Kia, Lexus, Mercedes Benz, Opal, SsangYong and so forth. So waste no more time and contact us today! Our Car Wreckers Beckenham 6107 crew look forward to hearing from you. Just make sure to provide your vehicle details, including VIN numbers (if possible), it will save our and your time to get the best quote for your vehicle.